A collection of two-storey, three bedroom houses located at The West Bay Club & Spa near the quaint coastal town of Yarmouth on the stunning Isle of Wight. Featuring three bedrooms; one double with en-suite shower room, one twin and a bunk room, these charming cottages are an excellent choice for families. The welcoming open plan living area is a great space to gather together and plan the day’s activities or to enjoy a delicious meal, prepared in the well-equipped kitchen. Outside, unwind on your private decking or enjoy a family activity in the large gardens. Guest membership to the Country Club is provided within your price so you can enjoy a wide variety of activities including bespoke swimming and activity programs for the little ones. There’s a games room, large sports hall and outdoor football pitch and tennis courts so plenty of opportunity for a whole range of family fun. For the adults, spend time relaxing in the Island Wellness Spa with treatments that are carefully performed to enhance the body and mind and stimulate health and well-being. Also don’t forget to explore your surroundings with miles of rolling countryside and heritage coastline just waiting to be discovered. Three bedrooms: 1 x double with en-suite shower, basin and WC, 1 x twin, 1 x bunks. Bathroom with bath, shower over, basin and WC. Ground floor basin and WC. Open plan living area with kitchen, dining area and sitting area. Further information including timetables will be sent post booking by West Bay. Whether you’re looking for blissful relaxation to unwind and restore a sense of wellbeing or for a family holiday packed with fun and activities – a break at The West Bay Club & Spa is the perfect coastal getaway. Wellness is at the centre of everything we do. Our friendly and experienced team will help you develop and maintain a holistic approach to your health and fitness, and maintain wellness in every aspect of your life. Yoga. Our expert yoga teacher Jenny Andrews-Smith offers bespoke instruction and group classes, drawing on a variety of yoga styles including Ashtanga, Vinyasa, Hatha and Sivananda, to improve flexibility, balance, focus and breath awareness. Pilates. Get involved in our Pilates programme to balance your mind and improve your posture. We offer a wide range of Pilates classes for every ability level including Fundamental Pilates, Classic Pilates, Dynamic Pilates and Matwork. With over 60 fitness classes a week including Barre, Pump, Insanity and Dance Workshops, there is a class to suit everyone. 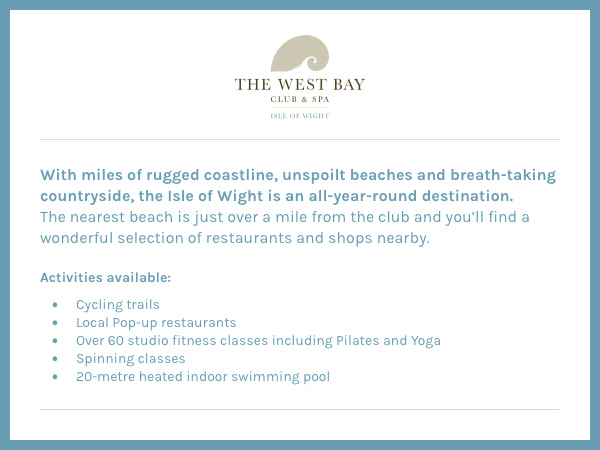 Our classes are free to members and guests staying with us, making The West Bay Club the perfect place to get active. This renowned indoor cycling class is designed to offer the ultimate cardiovascular workout as well as toning and strengthening. With over 13 spinning classes a week, there is plenty of opportunity to get involved and to try different types of spinning class. Plus we’ve recently added New Spin & Run! Join Stan for this weekly session that combines the best of both worlds! Hit the pedals for a 45 minute intensive blast of spinning, then jump out of the saddle and set foot on the trails of the West Wight for a 45 minute run. Splash out in our 20 metre heated indoor pool or join one of our Aqua-Fit or Lane Swim sessions. We also offer a range of family fun swim times where you and your children can get involved in games and activities including Water Polo and Wet ‘n’ Wild. Enjoy private swimming lessons with one of our West Bay swimming instructors. Suitable for all ages and abilities, our swimming lessons are bespoke to your individual needs and are designed to help you gain confidence in the pool and improve on skills and stroke technique. The West Bay Club is the perfect place to base yourself if you want to explore the Island on two feet. Based in the beautiful open expanses of the West Wight, hundreds of miles of pathways are right on your doorstep. With over 200 miles of cycle paths, exploring the Island’s beautiful landscape and rugged coastline couldn’t be easier. To make sure you get the very best cycling experience, our team of qualified trail leaders have put together a series of recommended cycling routes, complete with easy to follow maps for every ability – from total beginners through to advanced cyclists. The attractive seaside town of Yarmouth is the oldest town on the Isle of Wight, and its busy harbour is a haven for all kinds of watercraft, with the terminal used for regular mainland ferry crossings to Lymington. There's great cycling (and a cycle hire shop) and walking to be had along the coastal path. Why not take an energetic stroll at the nearby Tennyson Down and Headon Warren. Sandhard beach is 15 minutes' walk away, with Colwell Bay with its sandy beach and amenities for the family 7 minutes away by car. Yarmouth's pier and sailing club jetty is another good spot for crabbing. Four miles away is Compton Bay, famous for dinosaur remains; head there at low tide and see if you can find the two enormous three-toed feet. West Wight is an Area of Outstanding Natural Beauty and Yarmouth is an ideal base from which to explore this wonderful island.. Photos are a representation of the cottage type that you are booking. Layouts and décor may vary. Note: Bunk beds are recommended for children aged 16 or below although may be suitable for some adults. Your ferry crossing is for a maximum of 6 adults in a standard vehicle or MPV. Additional or larger vehicles may be accommodated at an extra charge. Ferry crossings are subject to availability. Limited Country Club opening hours apply across Christmas and New Year weeks. Please contact us for more information. † Based on two adults and two children. &ddagger; Based on one car and up to six adults on a Saturday in summer.